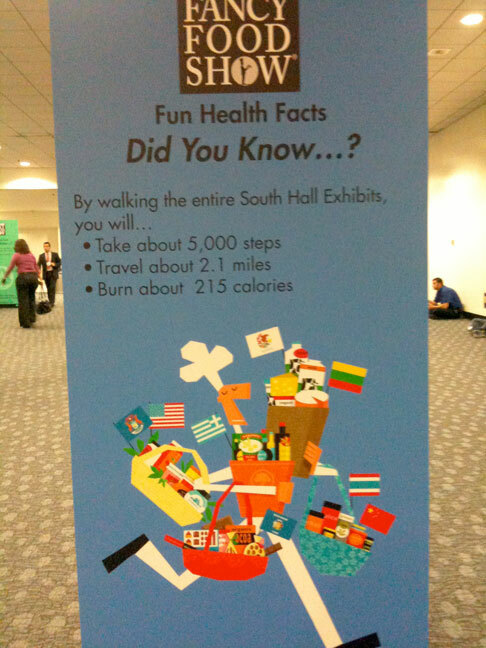 Walking the shows burns calories! I kicked off the year with a relaxing, much need rest outside of Guadalajara, Mexico. What better way to say goodbye to one year and usher in a new, than floating in mineral water, hiking and sipping peppermint tea. Mexico isn’t know for its vast tea selection, so when I head south of the border, I bring my own (as should you) or just sip an herbal infusion. After 10 days of peace and quiet contemplation on the tea year ahead, I returned home only to board another flight West to the most delightful epicurean city and one of my favorites – San Francisco – to walk the mega aisles of the trade only, Winter Fancy Food Show. If you happen to be in the food industry in some capacity, and have attended one of these shows, then you know how absolutely insane it is to navigate these aisles, through thousands of people sampling mass amounts of food. My plan was to walk the entire show in one day and then walk the streets of San Francisco and site-see the rest of the days I was there. Not possible. The first day I only made it through the North Hall aisles – and that was a warp speed. I needed all 3 days on the floor to really get a good feel for what I was looking for and seeing some of the vendors I needed to contact. I’m happy to say that I saw many old friends, like the lovely Cynthia from Adagio Teas – always a welcoming and friendly face – and we had a good bit of time to play catch up. 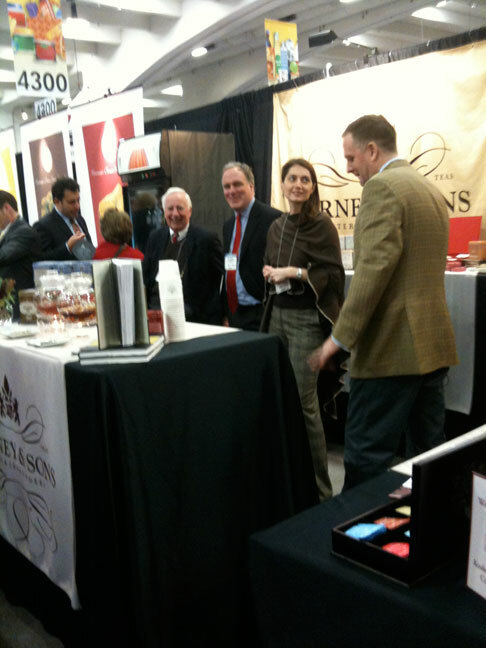 The Fancy Food Show isnt teacentric but some tea vendors make an appearance. Tetulia Teas, Two Leaves and a Bud, Tea Forte, Stash, Zhenas Gypsy Teas and Harney & Sons. I asked Mike Harney if he’d autograph a copy of his new Harney Guide To Tea book for me and he was delighted to do it, making jokes about the spelling of my name since John Harney’s wife (Mike’s mom) is an Elyse and I’m an Elise. John was sitting on his stool in the back smiling and laughing, as usual. I’m a huge fan of Harney & Sons and if I wasn’t drinking my own tea, I’d be drinking theirs. We also tried an amazing green tea olive oil that was crazy delicious. The taste of the green tea oil was beyond what I expected. The dipping oil was just perfect to pair with a great french bread, some oils, cheese and green tea. It made me happy to find something so unusual, tasty and healthy. 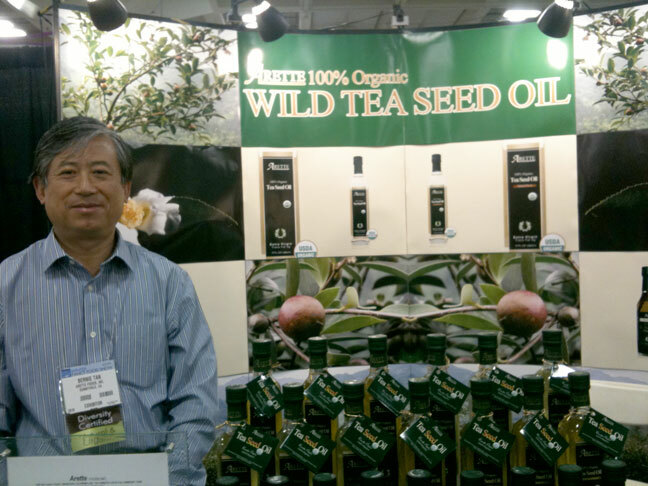 The company is called Arette Oils and they have a whole line of dipping and cooking oils made of green tea. I’m teetering on the verge of placing an order for immediate consumption. There was an interesting new RTD (Ready To Drink) tea company called Silence Teas that had one of their people sitting in lotus pose “meditating” at the booth. Apparently if you sip one of their iced teas you will experience peace. I was told they are local to the DC Metro/Maryland area so we’ll be looking for them on the shelves soon. I was pleasantly surprised to see and meet some cool new peeps launching new companies. One in particular is a company called: CookieZen and they are based around the corner in Falls Church, VA. It is the brainchild of two lovely woman (working mothers and friends) named Leah and Laura who have developed these tasty cookies to pair with wines. I tasted and loved the flavors especially the iced lemon sugar cookie. Leah is the master baker and Laura is the marketing mastermind. Their concept is unique and I’m happy to help them get there name out there. I, of course, am interested in them for tea and cookie pairings… so we’ll see how that works out in the future. There was another interesting product that we became aware of but it wasn’t featured on the show floor. 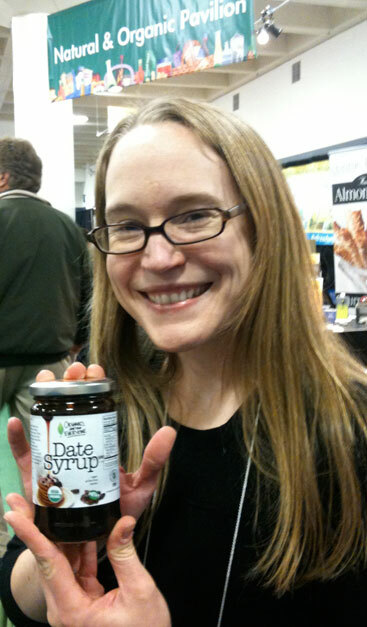 I met a woman named Colleen who owns Organics Are For Everyone and she is about to launch a very cool new product that is virtually non-existent in the US: Date Syrup. She told me that having lived in UAE with her husband for many years, she developed a love of the fresh date syrup they use over there for pancakes etc… She now flies back and forth to the Middle East sourcing dates and making syrup! I managed to get a sample jar from her to try on my new gluten-free pancake mix. It was so unusual and so tasty! You can go to her website and order it directly. There was so much more to see, sample and digest at the Fancy Food Show and I’d be blogging forever if I were to mention every amazing product that caught my eye. I plan on attending the Summer Show at the Javitz Center, NYC in June, which believe it or not, is even larger than the West Coast show. I want to leave you with this little video to show you what its like to walk the show floor on the slowest day of the event (the last day) so you can get a feel for the madness! Enjoy!